In this study synchronization performance and gait parameters were assessed as healthy young adults with strong or weak beat perception synchronized to low-groove music, high-groove music, and metronome cues. Slowed gait in patients with Parkinson’s disease (PD) can be improved when patients synchronize footsteps to isochronous metronome cues, but limited retention of such improvements suggest that permanent cueing regimes are needed for long-term improvements. Music opposed to metronome cues may make permanent cueing regimes more pleasant, improving adherence; however, music cueing requires patients to synchronize movements to the “beat,” which might be difficult for patients with PD who tend to show weak beat perception. One solution may be to use high-groove music, which has high beat salience that may facilitate synchronization, and affective properties, which may improve motivation to move. As a first step to understanding how beat perception affects gait in complex neurological disorders, we examined how beat perception ability affected gait in neurotypical adults. Assesses beat perception in the context of music by requiring participants to decide whether metronome beeps superimposed over instrumental music clips are correctly aligned with the perceptual beat of that clip. Each trial consisted of the participant walking eight lengths of a 16 foot Zeno pressure sensor walkway. For the first trial the participant walked in silence to establish their preferred step rate (# of steps/ minute). For each stimulus the participant completed one trial at their preferred step rate and one trial 22.5% faster than their preferred step rate, for a total of 18 stimulus trials. The following graphs show 1) How accurate participants were at walking to the music/metronome and 2) How variable their steps were when trying to walking along to the different stimuli. In both graphs a lower bar represents better performance; 1) better accuracy, 2) less variable. Participants were most accurate and least variable when walking to metronome cues. Accuracy and variability were next best for high groove music, and worst for low groove music. Weak beat-perceivers in most conditions had poorer synchronization accuracy and variability compared to strong beat-perceivers, especially when walking to low groove Music. The following graphs show different gait parameters of participants while walking to the different stimuli. The goal of auditory cueing for gait in Parkinson's patients is to increase their walking speed by increasing their step rate and step length, without making patients unstable and at risk of falling. ​Left panels of Figure 2 show that at preferred tempo, weak beat-perceivers showed slower stride velocity than strong beat-perceivers across all three cue types. This was large because weak beat-perceivers tended to reduce step length during cueing, unlike strong beat-perceivers, who successfully maintained step length. 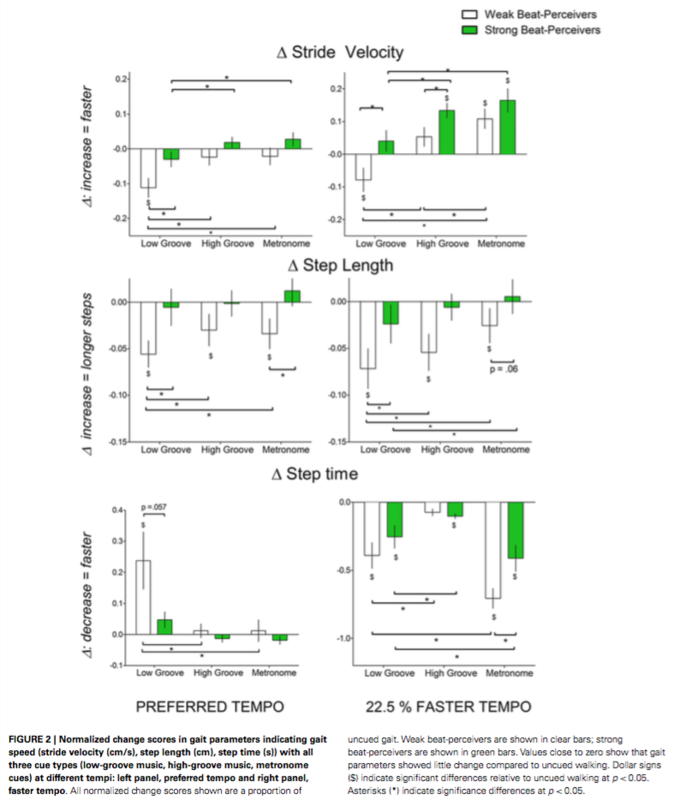 Right panels of Figure 2 show that at the faster tempo, weak beat-perceivers sped up stride velocity while shortening step length and step time, indicating that weak beat-perceivers sped up stride velocity by taking faster but shorter steps, whereas strong beat-perceivers sped up stride velocity by taking faster steps of similar length to those during uncued walking. ​Wider strides, longer double support time (time spent with both feet on the ground), and greater stride length variability indicate greater attentional demands and greater cautiousness during gait. Figure 3 shows the normalized change scores for stride width, stride length variability, and double support time. Weak beat-perceivers showed larger increases in stride width and stride length variability than strong beat- perceivers, and this pattern of results was particularly evident with low-groove music. The primary finding of this study is that individual differences in beat perception ability determined whether gait was maintained or impaired by synchronizing to music and metronome cues.